Virtual reality is pretty convincing when you’re all jacked in and wired up — but even the best headsets today aren’t particularly sharp. Sharp, taking notice of this, has produced a display specifically for VR that’s double the resolution of what’s out there right now. It’s still a prototype, of course, and was on display at CEATEC in Japan. PC Watch snagged a few pics of the Sharp booth, where the tiny screens were being shown in both rectangular and circular forms. At 2160×1920 (for the rectangle, naturally; the circle is likely 1920 in diameter) and just about 2 inches across, these displays have an impressive pixels-per-inch rating of over 1,000. The 5-6-inch displays we have on our phones are generally in the 300-500 range, and that’s also the case for the panels being used inside the Oculus Rift and HTC Vive. It’s not the highest PPI ever, though — panels with over 2,000 PPI have been made, but this one is tailored to VR. Assuming these Sharp displays are at least as good in terms of color and response time — and their IGZO method suggests that should be the case — they could lead to a huge improvement to the VR experience. Remember the iPhone before and after Retina display? That kind of huge. 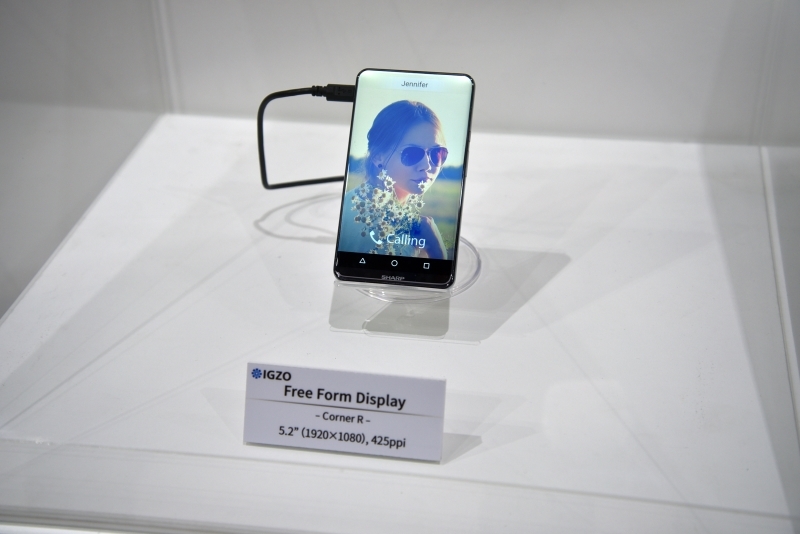 One other device on display caught my eye: this 5.2-inch, “Free Form” HD panel with rounded corners used to create an impressive edge-to-edge phone prototype. I’d definitely rock that. Head over to PC Watch for more from Sharp’s booth.